Our old dog, Brandy, had been gone for several years and we were finally at a point in our lives where we had the time to devote to a new puppy. We started attending dog shows and talking to breeders, trying to decide what breed would work for us. We were checking out the PBGV's at a show and the breeder suggested we get a copy of Choosing a Dog For Dummies. If you are still trying to make up your mind, buy this book!! We decided to use it to make our decision. There had been some valls at the show and we looked them up out of curiousity. Everything about them fit......long lived, excellent with children, not too big, wash and wear, smart, loving. This was the dog. We found Solborg Swedish Vallhunds in Atascadero, the only breeder in California, and made an appointment to meet Ivy, Dan, and the pack of five dogs. We first met with them at a dog show and had a brief visit. We then spent an afternoon with them when they had a litter of six puppies. There's nothing like puppy breath! This was doggy heaven. The dogs all live with the family, no cages. Definitely the type of people we wanted to get our puppy from. After that meeting, Ivy agreed to put us on her puppy list. The following September Maija came through with two girl puppies. We had fallen in love with Maija and wanted a female. We were ecstatic. We had not planned on showing Sophie, just wanted a companion....maybe do a little obedience, or agility. Ivy's first priority, and ours, in selecting puppy homes is a good loving home for the puppies. We decided to try showing and had so much fun with all the other vallhund owners, we kept it up. We all were showing our own dogs. Everyone was supportive of each other and we usually would hang out in one big camp at shows, dogs and owners inside a big x-pen. This is not what our friends with other breeds experience. It turned out the Sophie has excellent conformation (the rating she received at our national specialty). She became a Grand Champion and is now working on nose work, rally obedience, herding, all the fun stuff. 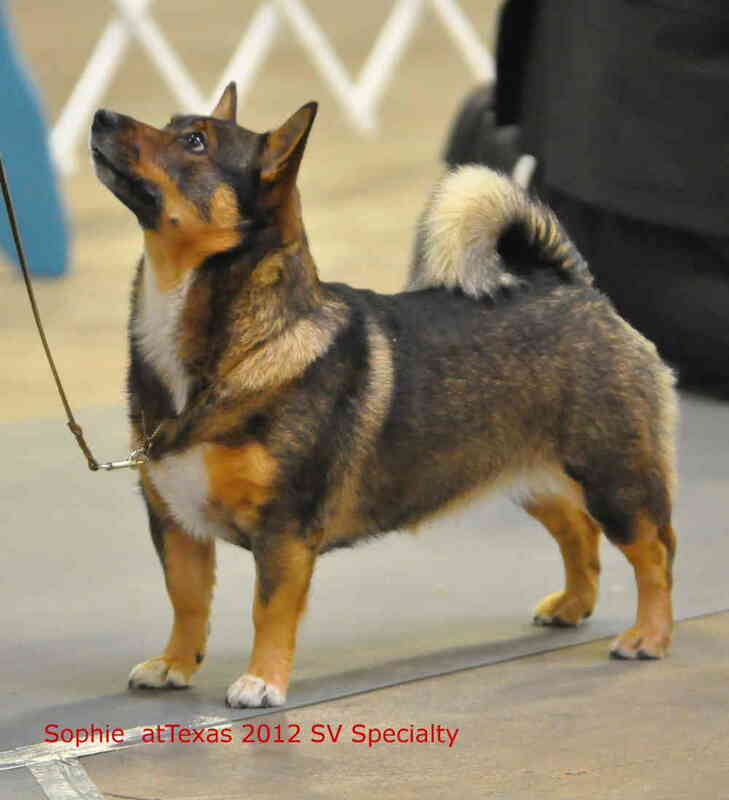 June 6 2014 Sophie got her Bronze Grand Championship by winning BOB over 10 other Vallhunds! Sophie had a puppy on 8/13/2013 !!! To see her time with us follow these links. Sophie's times in the Show Ring.